TV shows are a fickle beast. Having been lured into watching all the seasons of Lost, I’ve grown jaded on some of these shows and am more willing to stop watching, rather than fall into the sunk cost fallacy. It also helps that if a show does turn out to be awesome, you can now easily go back and binge watch the whole thing. I’m glad I stopped watching HIMYM after the third season. 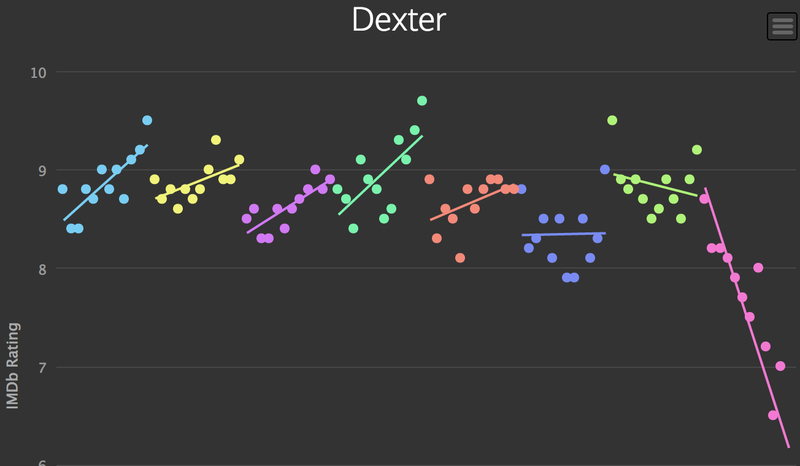 According to this graph (which is the main reason I’m writing this… this site is so cool) you can see the last season really sent people on a roller coaster ride. 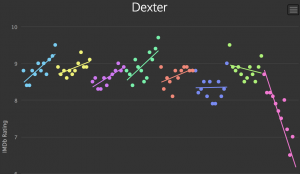 At least it wasn’t as bad as Dexter though. Wow, that’s a warning sign for a TV show if I ever saw one.